In keeping with its commitment to expanded civic engagement of its students and the surrounding community, Truman State University is proud to announce that it will be sponsoring two congressional primary debates. In conjunction with KTVO-TV, Truman State University will host both the republican and democratic candidates for Missouri’s Ninth Congressional district. The republicans will debate first on July 22 and the democrats will follow on July 24. KTVO will be taping both debates and airing them at a later date. They will also be aired on KTVO’s sister station KHQA in Hannibal, Mo. Both events are open to the public and are free of charge. Doors will open at 5:30 p.m. and close at 6:30 p.m. in Baldwin Auditorium. Each event will start at 7 p.m. Seating will be done on a first-come-first-served basis. Please direct any questions to Jay Self, assistant professor of communication, at 785.6044. Truman State University’s School of Health Sciences and Education, the Regional Professional Development Center and Northeast Missouri Disability Support Group are proud to present Kathie Snow, author of “Disability is Natural: Revolutionary Common Sense for Raising Successful Children with Disabilities.” The workshop will take place from 9 a.m.-4 p.m. July 25 in the Student Union Building on the Truman campus. The cost to attend is $55 and includes lunch. Snow will be discussing her manual that contains positive, common sense approaches to ensure children with disabilities live the lives of their dreams. The parent of a young adult child with a disability (who is now attending college), Snow combines her earlier career in the media and her experiences in the disability arena to ignite positive and long-lasting change in the lives of people with disabilities and their families. Snow believes that inclusion of people with disabilities can best be accomplished when they move from clienthood to citizenship. She believes this can occur when individuals and their families move away from dependence on special services and begin accessing the abundant supply of natural supports and generic services in the communities. Residents of Adair County who have a disability or have a family member with a disability may apply for a scholarship to attend free of charge. Call 665.9400 for scholarship information. To R.S.V.P. contact Donna Brown at 341.9993 or register online at http://www.tailor-made-events.com/blog/?page_id=5. Upward Bound (UB) students recently experienced an afternoon focused on service and learning beyond the four walls of the classroom. In their afternoon of “Beyond UB,” these 60 area high school students had the option of moving beyond themselves either by doing service projects on Truman’s campus or investigating life in an eco-friendly environment. Students choosing service projects worked at the Truman Recycling Center in conjunction with the Truman Physical Plant. Students at the Recycling Center collected and separated recycled goods. Students working with Truman grounds staff weeded the Virginia Stanton Memorial Gardens outside Pickler Memorial Library. Students learning about a living environment outside that of their personal experience visited Dancing Rabbit, an eco-village near Rutledge, Mo. There they learned about environmentally-friendly ways of living, from solar power to earth homes. UB students in this six-week residential program enjoyed the opportunity to explore new ideas and to give back to the Truman community that has given them so much. In program year 2007-2008, Upward Bound received $406,635 (94 percent of total funding) from the U.S. Department of Education and $27,065 (6 percent of total funding) from Truman State University. 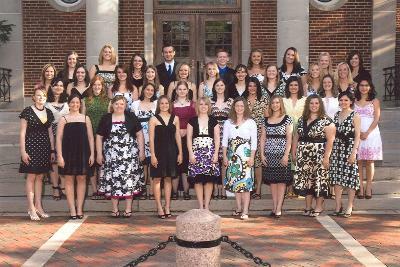 Thirty-eight senior nursing students were honored at the Nursing Recognition Ceremony May 9 in Baldwin Hall at Truman State University. First row (left to right): Rebekah Cross, Story Sollars, Rebecca Strychacz, Anna Ratcliff, Sara Lloyd, Juli Hermanson, Elena Williams, Lindsey Barhko and Jennifer Dine; second row (left to right): Melanie Schutz, Amanda Skaggs, Kindra Rickman, Anne Kresie, Megan Merrigan, Sydney Moore, Monica Piane, Megan Galloway and Nohemi Alvarez-Landa; third row (left to right): Jessica Holt, Kristen Bruce, Shannon Kelly-Salo, Jennifer Jacobi, Kate Wertz, Joanna Venneman, Rosana Lebron, Molly Mudd, Alison Richards and Sarah Pleiness; fourth row (left to right): Kathleen Shaughnessy, Kathryn Adler, Kimberly Church, Blake Meyer, Greg Wisa, Jamie Weninger, Beth Falkner, Kathryn Johnston, and Angela Prost. Iryna Sydorenko is not pictured. Please take a few minutes to join Neely for refreshments and reminiscing. She has been at Truman for the past 35 years. July 28-31 • 7:30 a.m.-6 p.m.
Aug. 1 • 7:30 a.m.-5 p.m.
Aug. 4-8 • 8 a.m.-5 p.m.
Aug. 11-15 • 8 a.m.-5 p.m. If you have planned an on-campus event for the upcoming academic year, do not forget to submit it to the Master Calendar at http://calendar.truman.edu/submitevent.asp. Do you love classical or jazz music? The Naxos Music Library (available at http://truman.naxosmusiclibrary.com/default.asp) has an extensive collection of classical, jazz, world, folk, and Chinese music recordings. Users can read notes about the music and biographical information about the composers while listening to the recordings. The Truman Football Program is introducing an exciting new program in 2008, bringing together families in Kirksville and the incoming Truman State University Bulldog football players. Volunteer families will be asked to host two incoming freshman players, allowing them to gain a valuable connection to the Kirksville community. Host families will receive two general admission season tickets and a Truman Bulldog football T-shirt. The Bulldogs will kick off the 2008 season with a family barbecue in August, where the host family will have an opportunity to meet the two players, other host families, and members of the coaching staff at Truman. During the course of the season, volunteer host families will be asked to have dinner with their adopted players at least once a month. The host families may invite their players to attend additional family functions. The Football Program wants to help the new players build relationships that will last throughout the four years at Truman and into the future. For more information, please contact Shannon Courier at 785.4252 or 785.0459. Sodexo invites members of the Truman community to attend barbecues on the Mall this summer. The remaining date is July 25. The Next STEP Office invites the Truman Campus Community to attend the 2008 Summer Undergraduate Research Experience (SURE) Poster Symposium. The symposium will take place from 1:30-4 p.m. July 25 in Magruder Hall Cyber Cafe. Light refreshments will be served. Please join the students as they share the culmination of their 10-weeks of intensive research. Twenty students have been working individually with a faculty mentor in agriculture science, biology, chemistry, computer science, mathematics and physics to complete this research project. Please contact Jennifer Thompson in the STEP Office at 785.7252 or step@truman.edu with questions. The next issue of the Truman Today will be a Truman Week special edition published Aug. 17 and distributed to first-year students. The Truman Today will resume weekly publication beginning Aug. 26. Submit news items for that issue by Aug. 20 to heidi@truman.edu.